6 Chocolate Chip Cookies... the whole batch. When I first moved to NYC, I lived in Manhattan with three guys I graduated college with. After that apartment, my boyfriend of the time lived with two other dudes down in Brooklyn, and I’d stay with them often. 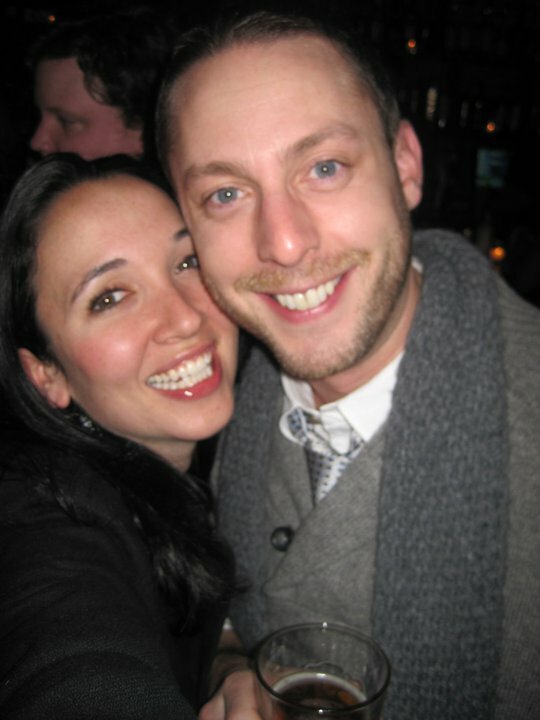 For a while after that the boyfriend and I lived in Queens, and his brother crashed with us for a few months. When I wasn’t home during those raucus years of my twenties, I’d be going from show to show with casts full of eager eaters. The point of that little history: I always had someone around to eat the batches of sweets I whipped up. But now I’m a single gal, and my roommate doesn’t contribute enough by far in helping me rid the apartment of all things that come out of my kitchen. I pawn sweets off on my upstairs neighbors after walking our dogs, while we have a glass of wine or talk food (love the chefs in my building). But what I don’t give away, I eat. Which means no matter how few I eat, I still eat too many. For someone who’s 5 foot 2 and has hypoglycemia and gains weight easily. Sometimes you don’t need three dozen cookies staring at you while typing an article about Third Wave Feminism (after having come out of the kitchen barefoot and covered in flour) or while watching Bored to Death or The Next Iron Chef: Super Chefs (which you should be watching if you’re not…). You just need a few. So here’s how to do just that. 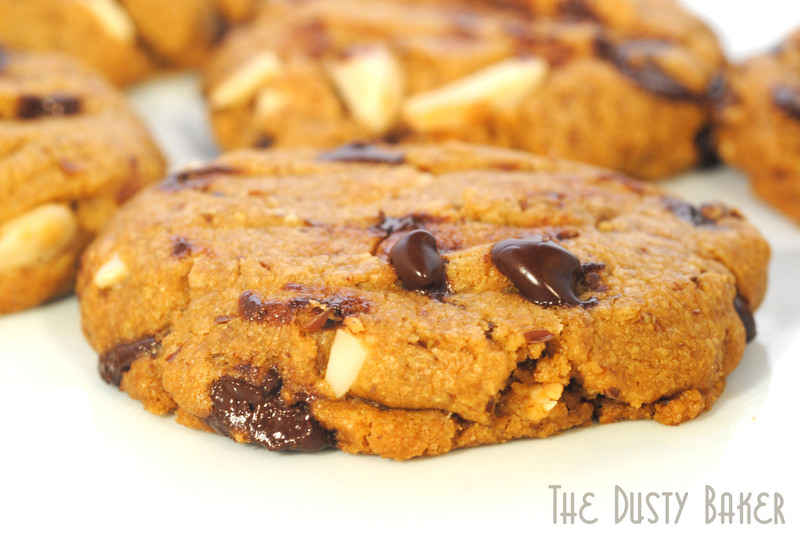 How to make just 6 gluten-free chocolate chip cookies. 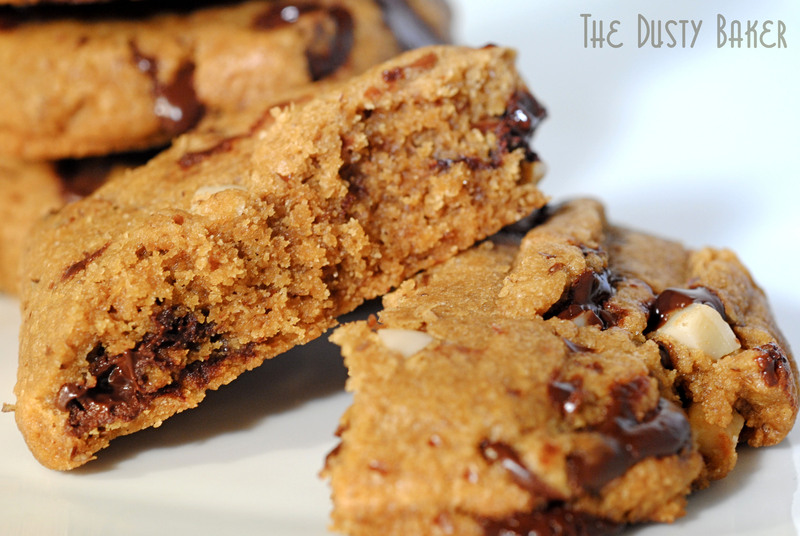 That are rich, and sweet, with just enough chocolate and a boost of flax (both for fiber and to bind the cookies together since we’re not using eggs), and a bit of extra protein from some nuts (optional, of course). 3 Tbsp slivered almonds, pecans, walnuts, oatmeal etc. Combine flour, flax, xanthan gum, salt and baking powder in a small bowl. In the bowl of a mixer, beat butter and sugar until fluffy and smooth – about 2 minutes. Add molasses and beat to combine. Add the flour mixture in a beat on low until together. Continue to beat on high for about 2 minutes. Add the chocolate chips and nuts and beat in to combine. 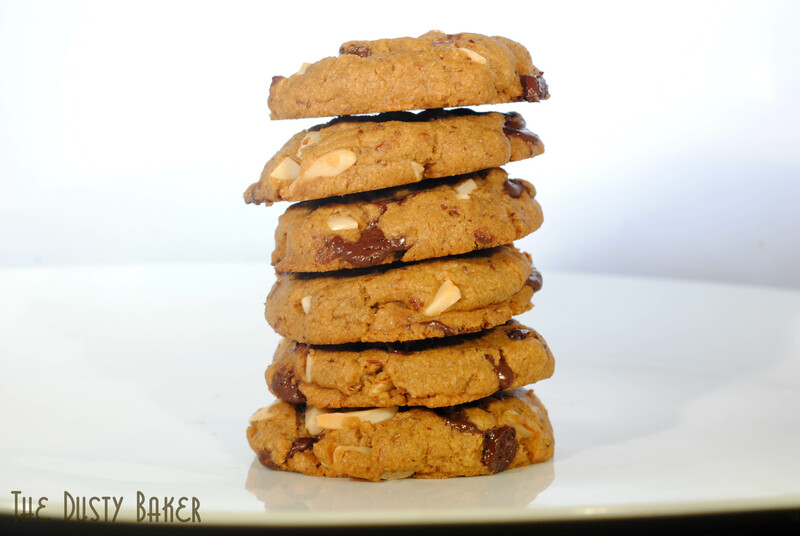 Use your hands to proportion 6 cookies, and place evenly on cookie sheets, flattening slightly. Bake for 18 minutes, cool slightly before serving. Notes: make sure you beat this batter well so that the butter softens completely and the sugars dissolve in, otherwise your cookies will flatten horribly. I used organic white sugar, which melts better than palm or sucanat in this recipe. Now and then it’s a good thing to listen to those around you who know you well. I love my work. I love my time in the kitchen, this blog, writing for websites, writing articles and working with Easy Eats Magazine, which has been an incredible trip so far. But I’ve recently been made aware that unless someone demands that I turn off for a little bit and just enjoy… well, I don’t naturally do it for myself. I so love how I fill my time that it seems I’ve forgotten the joys of an entire day without a computer, a smart phone, a fully stocked baking kitchen, or a to-do list. 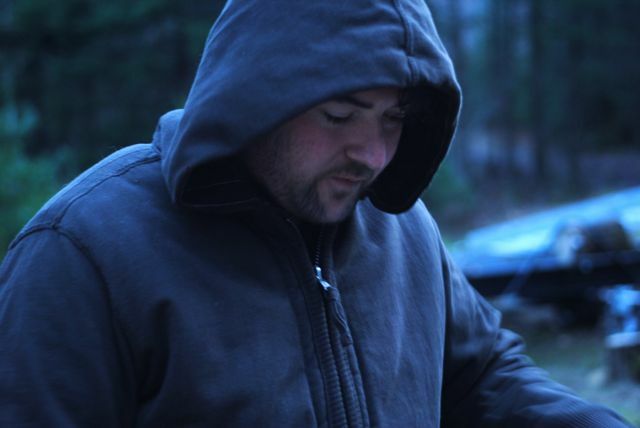 So last weekend my father and brother intervened and forced me to leave my computer and phone at home and spend the weekend in the hills of Vermont with nothing but a grill, campfire, a few ATVs and rocky trails, and some pretty awesome people. Tough love, right? 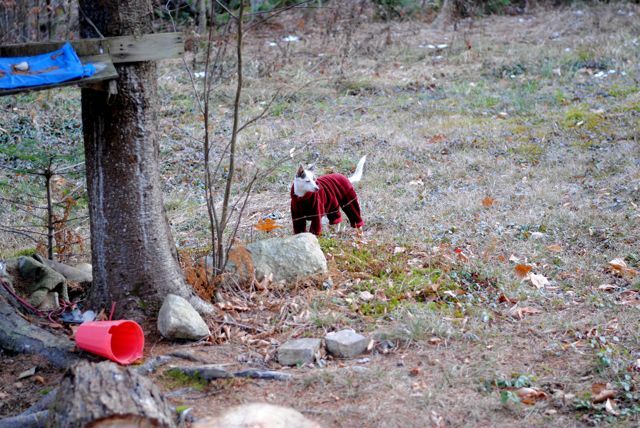 Mitra in her smoking jacket, perfectly at home in the wild. At first light Saturday morning I jumped in a van with the Dusty Brother, Mitra, my cousins Brien and Tanya and their daughter Maria. We had the ATVs strapped onto a trailer, a huge pile of wood, a mess of groceries and way too much booze for four adults. And, by George, it was an incredible weekend. Cold, but not frigid. We stayed in the framework of a house my father and the boys were in the process of building: no electricity or running water, but some basic kitchen equipment, a propane grill and rooms with mattresses on which we layered sleeping bags and warm blankets. 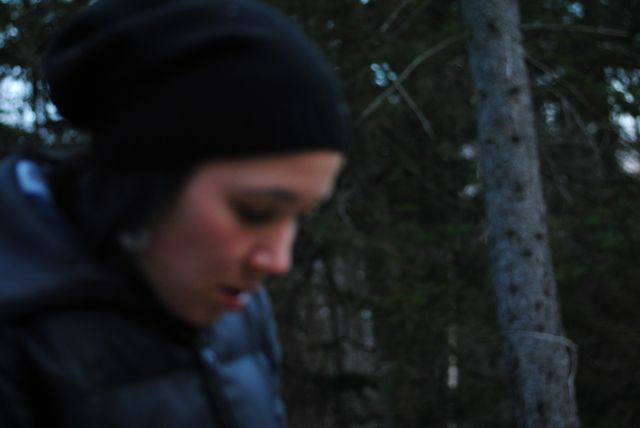 My brother introduced me to the thrill that is racing ATVs through rocky mountain paths – they were definitely rough. But the childhood drive to keep up with my baby bro led me to maneuvering a huge machine through mud puddles, between low branches, and up an intense, rocky, uneven hill that definitely inspired an inner pep talk before I got the courage to plow up it (in fairness I had totally made Dusty Bro drive the thing DOWN for me cause I totally thought I’d flip the thing, and he gave me no choice but to go back up alone – which I did, better than him, if I say so myself). We raced down the windy streets at crazy speeds and came home muddy and exhausted. I want to do that every day. Food was never far away, and I found incredible peace cooking simply: a skillet apple pie, hot toddies, roasted Brussels Sprouts and potatoes, a breakfast of steak and eggs, and a little improvised concoction I’m calling Spicy Mexican Mulled Red Wine Cocoa, that kept us warm and dizzy as we toasted by the fire. 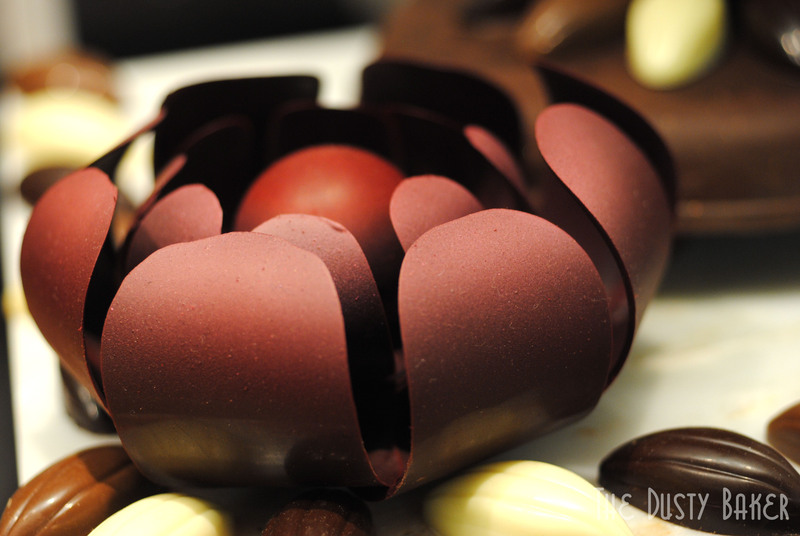 Warming, sweet and pungent, it was inspired by Paul A. Young’s Adventures in Chocolate. I saw his demo at the NY Chocolate Show and fell in love with his recipe. I’ll be making it soon in full at my holiday dinner. But for this trip I merely used what I had – some crushed Mexican chocolate I had spiced up for an article, a good bottle of red wine, some dark chocolate left over from S’Mores and some decaffeinated tea bags that were seasonally spicy. The result was rich, warming and festive – perfect when the sun went down early and the darkness brought on a bitter chill the weekend before Thanksgiving. Dusty Bro at the "stove"
Crush two disks of Mexican chocolate into a fine powder. Add a dash or two of cayenne pepper, two dashes of cinnamon and a dash of nutmeg. Preserve in an air-tight container. 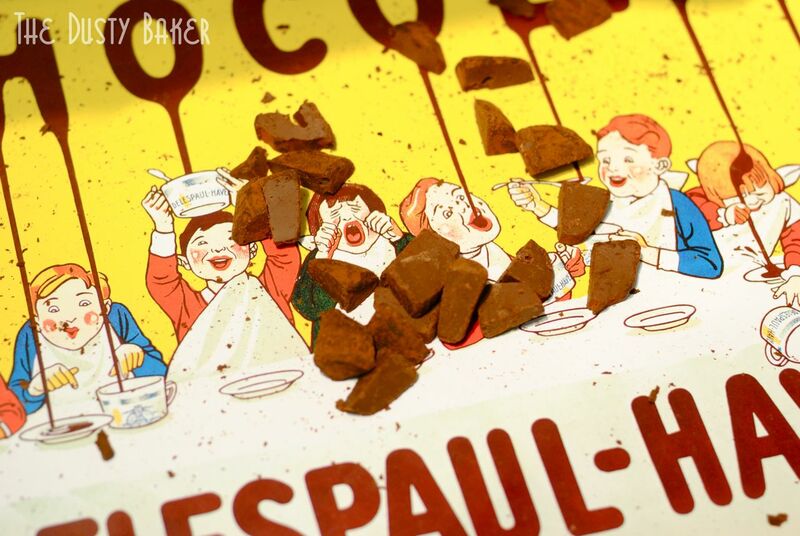 In the saucepan, combine the cocoa and enough water to just dissolve it. Put the saucepan on heat, and add enough wine to cover the bottom of the pan. Heat to steaming. Add teabags, and let infuse for about 15 minutes. 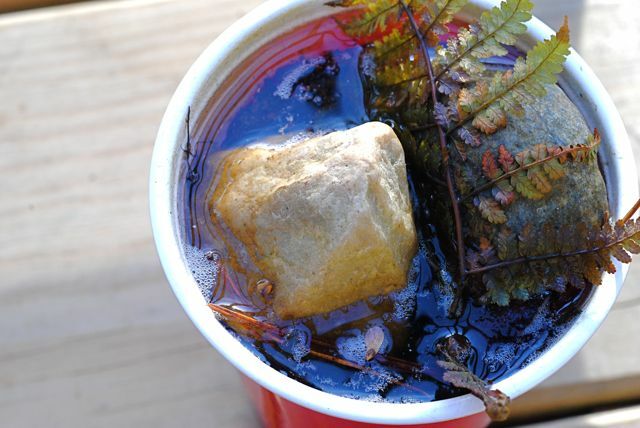 Remove teabags, add the chocolate (chopped) and stir until it dissolves. 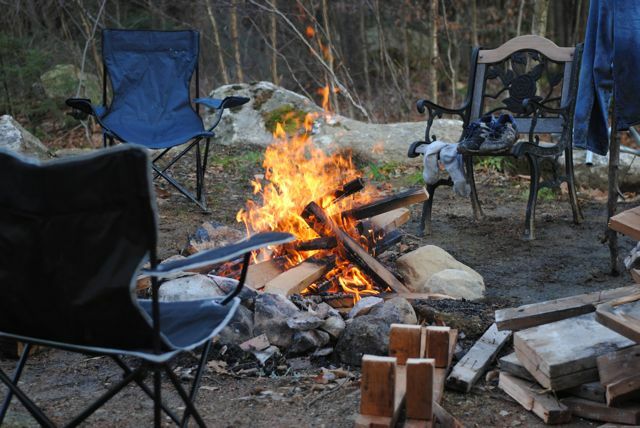 Serve and enjoy around a blazing fire. My family – they’re such good people with huge hearts, and a bale full of fun. My friends – like family, known for so long, and a bucket full of laughs. 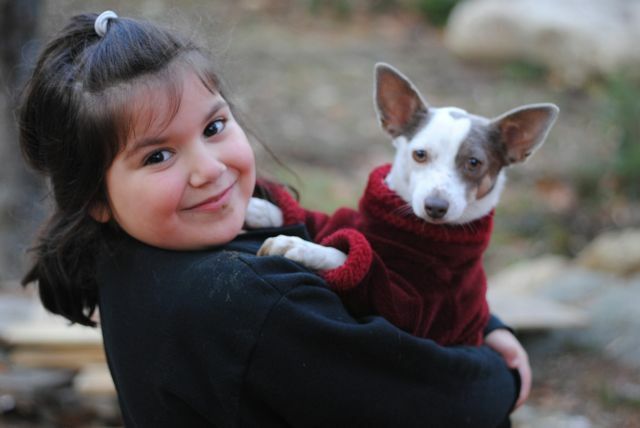 My dog Mitra – she’s the bees knees (do bees have knees?). This blog / selling my first article to my favorite food mag / working for my new favorite gluten free food mag / filming the DB cooking show / working with some stellar people. My apartment and my roomate. Seeing the hard work of my talented friends come into fruition as we work our tushes off. People in my life who give back generously. Click on the image above to a list of 50 incredible Nonprofits you can give back to this holiday season. Wishing you much peace, love and a sweet, sweet life. I love the holidays, and I love my friends and family. I love my dog, and my apartment, and my city (NYC or bust, baby). I love nights out with a good friend (hi Erin!) and long conversation over a bottle of red (why would he ever tell you those things? I’m still pondering). I love waking up tired, sitting in front of a huge monitor working on sourcing and writing and recipe-ing, and pondering the big questions, such as “have I ever seen the rain coming down on a sunny day?”. I love uploading photos on my computer and then unearthing one of something sweet. That I baked a few weeks ago. And drafted a blog post of. And never finished. Dusty Jacqueline, tricks are for kids. I love making scones. They’re incredibly quick to whip up for a family/friendy brunch as I learned from my dear friend Ruark’s father, Kevin. He would make the biggest, fluffiest, sweetest looking scones that I would drool over as I watched them being eaten (he or Ruark or Ruark’s mom Chris would have also made me some incredible omelet or something so trust me I wasn’t playing a sad song on his sister’s violin or anything). If you’ve never been to a food show or festival in NYC, they can be quite a spectacle. They’re usually a bit oversold, and ticket-holders scarf down samples with relatively little thought and stand in long lines for freebies, even if they’re not sure what it is they’d be getting for free. They “flit”, as I like to say. I’ve been accused of taking these events a bit too seriously, and I totally admit my part in this, but it’s because I take the joy of food seriously. Yes, I get that some people just wanna eat a huge variety of tacos or bacon or frozen yogurt on their Saturday afternoon. But me, I want to talk about the ingredients in the taco, the source of the bacon or, in this case, the dozens upon dozens of facets that make chocolate so indulgent, sensual, fulfilling and just plain fun. I want to stroll, not flit. I have a feeling a few of you out there might feel me on this. 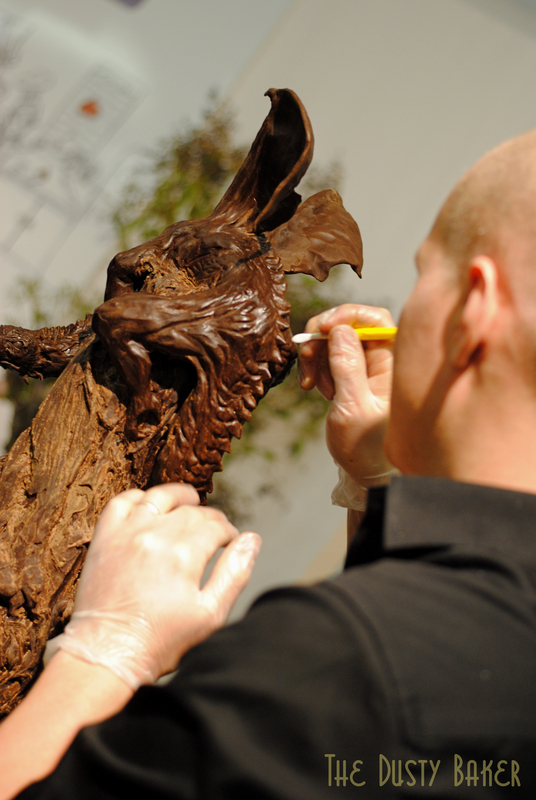 Okay, seeing someone sculpting chocolate just makes me happy, especially when it’s Håkan Mårtensson of Fika Espresso Bar. Håkan finds a lot of inspiration in fairy-tales and folk lore, apparent both in his sculptures and in the playful nature of the luxurious chocolates he’s created for Fika. Amongst the teeming amounts of truffles and hands grabbing for whatever they could get, it was a glorious moment to just watch his hands moving, unraveling a bit of imagination and observe others who stopped for a few minutes, mouths empty, to just take it in. Fika also makes an incredible whiskey and citrus jam that knocked my socks off. 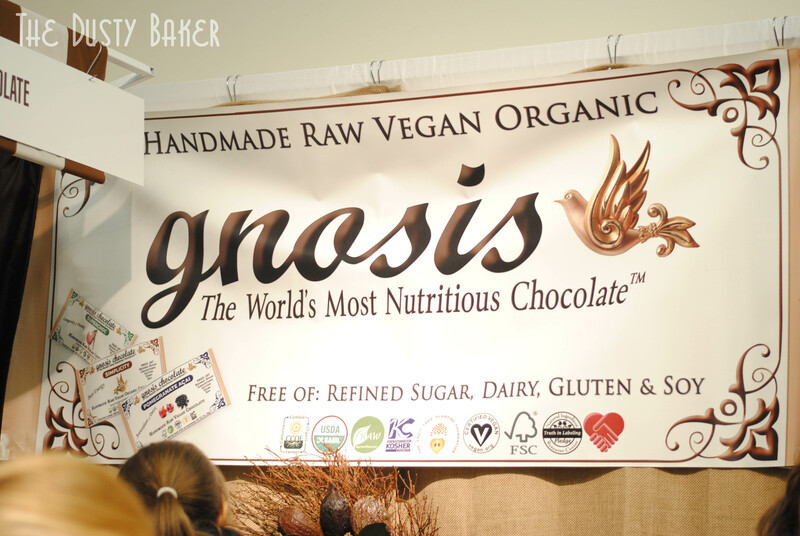 This was my hippie-heart’s favorite find of the festival: raw chocolates that are free of sugar, dairy, gluten and soy, packed with nutrient-dense superfoods and sourced from fair-trade purveyors from all the places you want your chocolate to come from. And, oh, right, they’re DELICIOUS! Some of my favorite were the Fleur de Sel, Peppermint, Almond Fig Spice and Mayan Heat. Options wildly off the cuff: Powerchock (“with superfoods for maximum protein assimilation and physical prowess!”), Sacred Feminine (“Let the herbs in this bar support every stage of a woman’s cycle”) and EnWhitenment (“White Chocolate w/o dairy, soy, or refined sugar. Become EnWhitened!”). They were so yummy I bought a bunch of bars for stocking-stuffers (crossing my fingers that my family only skims these posts now and then). Check them out: their brand, vision and contribution to health through deliciously sweet chocolate has my humble little thanks and stamp of dusty approval. I think it was at Jacques Torres. I’m not quite sure, I’m horrible at taking notes. And this little gem of a sculpture wasn’t getting as much attention as I felt it deserved, it being somewhat high for people to see and the samplings below taking focus. But it made me happy. This photo will most likely be the screensaver of something or another in my office soon. I couldn’t sample this, but my show-mate did note this as one of her favorites, one of the few she remarked upon later as being stellar in simplicity and taste. Call me a dork, but the whole reason I go to shows / events is to learn things about food. I chat up artisans and whomever about why their product makes their tale wag: why are you passionate about what you’re making? Because if you’re not passionate about it, I just can’t relate (unless it’s Halal after a night of drinking or something, of course. Food isn’t always art, sometimes it’s just damned good food. Or sustenance. You know where I’m going with that, right?). So my favorite time spent at festivals is often in watching the demos. I had not heard of Paul A. Young Chocolates or his book, Adventures in Chocolate, before. But Young sold me easily because (a) his presentation had the ease of someone who knew their trade extremely well and didn’t have to put on airs to impress anyone (b) his creativity in flavors was exciting and (c) the mulled-wine hot chocolate I sampled after was like everything good about winter and the holidays in a tiny cup, and I’m an even bigger nerd for the holidays than I am for cooking demos at food festivals. I couldn’t sample any of Young’s truffles (a pumpkin, one with port and Stilton cheese, and I forget the 3rd) but my show-buddy was delighted by them. And I was so curious as to what I could eat of his recipes that I bought the book, and am psyched to really begin my study of chocolate. 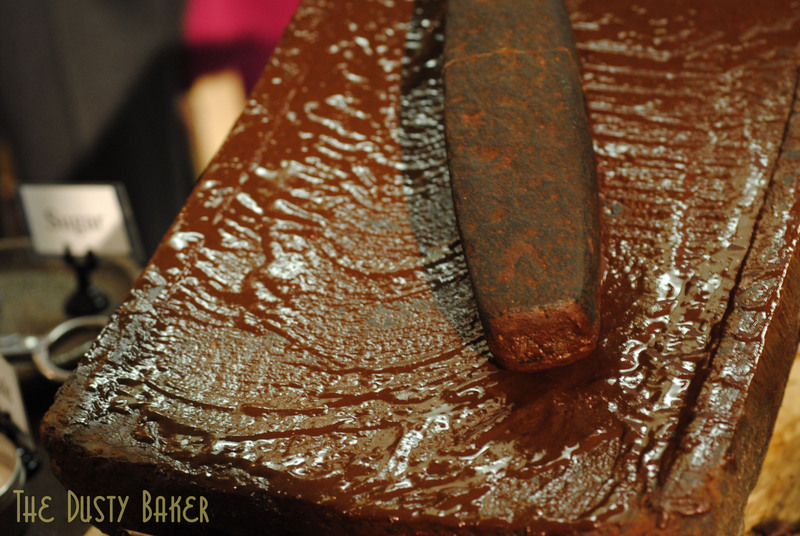 As a dairy-freer, it’s something I’ve stayed on the sidelines of before: how can you make a ganache without cream?! I’m ready to find out. I was so intrigued that I made a camp-fire version of the mulled wine hot chocolate while in Vermont last weekend, literally on an outdoor grill. I used some leftover Mexican chocolate I had ground with cayenne, cinnamon and nutmeg, some leftover dark Ghirardelli chocolate from S’Moresing, and a bottle of Malbec. Not exactly the posh British original, but it was damned warming and satisfying around a campfire in 30 degree weather after a long drive and racing ATV’s through the chilly forest (recipes from that trip coming). Oh, the Mulled-wine Hot Chocolate is on page 116 of Adventures in Chocolate. I suggest grabbing it. Would make a great Christmas gift too. Click to go to the book! This post has nothing to do with food. But as I was looking at some of my old work, I found this little book I made for a friend last year. One day I’ll get around to cleaning it up and doing something with it. For now, I hope you enjoy. Grab a little one for a cuddle and go on a wee bit of a journey. I recommend viewing full-screen. 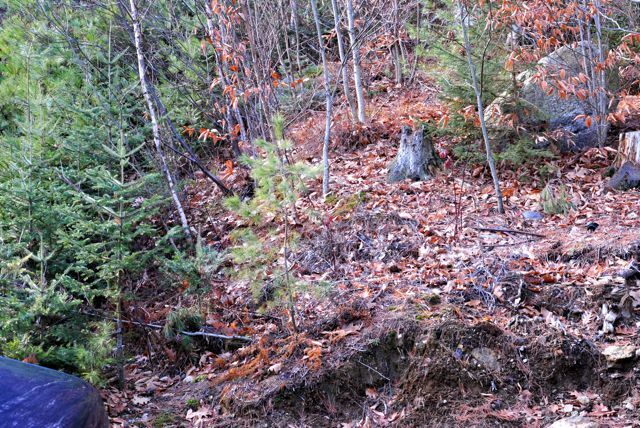 Click on the image to explore. Hello bloggereaders! I’ve missed the CRAP outta yah. So much so that, yes, there as a “h” on the end of “ya” to prolong the sound of the word and therefore encapsulate my joy at getting to blog right now. In a nutshell: sourcing for magazine, writing for diff magazine, shooting DB show, hanging with Meals on Wheels, managing family business, going to Chocolate Show. Okay forget that, I’m tired after waiting for my internet to decide to work while watching Pan Am (it’s like a bad car crash, I just can’t look away… or plane crash, as it were). Let’s just say I’ve missed blogging. Because while I’ve been baking away I haven’t had any time to take photos (with my new lens – which now makes my camera completely old and completely manual and completely ah-MAZ-ing) or write up the recipes. But I have still enjoyed reading YOUR blogs! And if there’s one thing I’m learning from the holidays approaching it’s to sit and have a breather now and then, to drink more water, watch my sweets, and to enjoy the little moments. To give thanks. Gracias to my life coach, Lindsay at Rosemarried and the murder-sprees on American Horror Story and Boardwalk Empire for reminding me of this lately. Now, end of the rambling and onto the donuts. I brought the batch upstairs to some neighbors: we all have dogs and now and then gather for walks, a glass of wine or some delicious food. One is a private chef and the other is just really good with food, so they’re great to run recipes by. The chef remarked that the flavor was “perfect, perfect, perfect”. But he had no advice as to how to get them to taste chewier, like a real donut. Because while these do taste amazing, the texture is more like a moist cake than a donut. Making them gluten free and vegan… gonna be hard to get the chew. I’m still working on it, but let’s just say that these are a delicious take on a classic donut. Their guests noted that the pumpkin flavor was full throttle, the texture was soft, the flavor balance was perfect and they might even fare well after a day or two of drying out a bit. I didn’t take any home with me – so they were a hit. I recommend having all ingredients at room temperature or slightly warm. Like a basic cake recipe, you want the ingredients to meld slowly and not be shocked into expanding and then collapsing. This recipe does NOT use xanthan gum. I usually do, in everything. But with this I found the absence of it made for a better texture given the amount of starch in the recipe already, as well as the flax, which also binds things together. Teff is wonderfully high in protein and fiber and the world’s smallest grain so it’s extremely fine and works well in this kind of recipe. If you can’t find teff flour, I’d suggest amaranth or quinoa – because of the moist pumpkin and spices, the flavors get absorbed well and give you all the punch-packing nutrients. I tossed some in cinnamon and sugar, made quick glaze for others with almond milk, powdered sugar and nutmeg, brushed some with melted coconut oil and then dunked them in sugar… have fun. Let me know what you think. 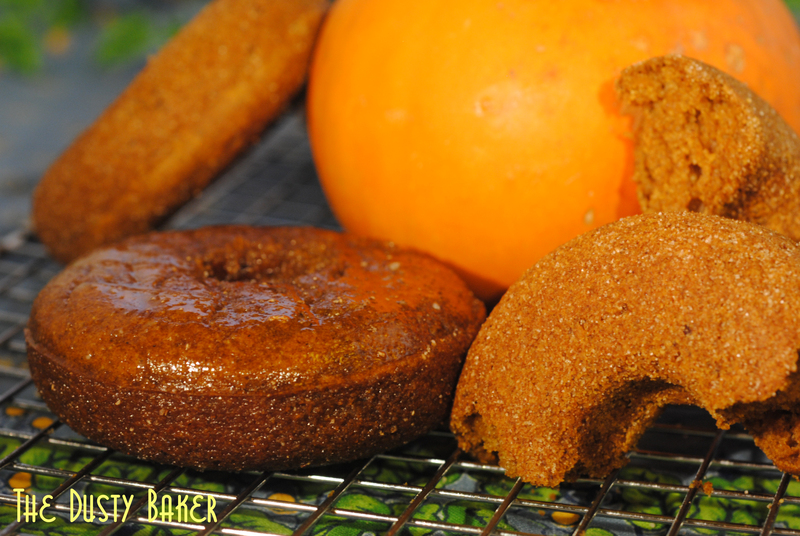 What’s your favorite gluten free donut recipe? I want to try it! Preheat oven to 325°. Lightly grease donut pan. Whisk dry ingredients into wet until thoroughly combined. Bake for 15-18 minutes or until springy to the touch. 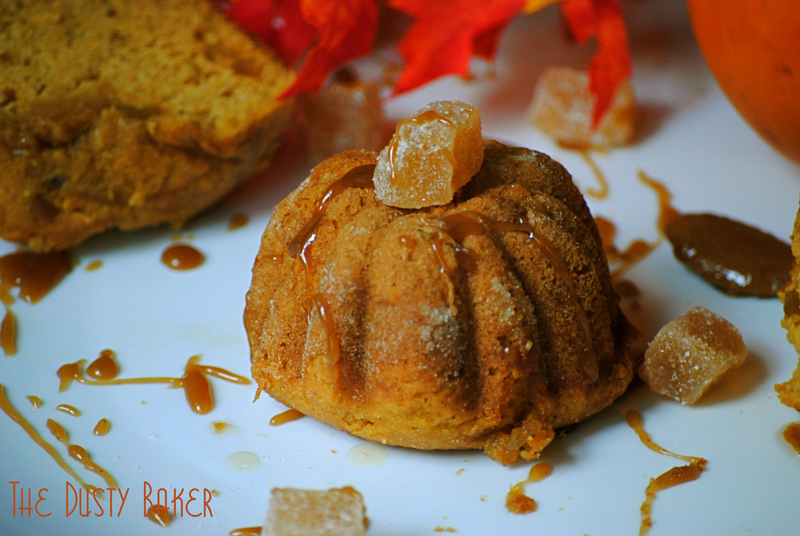 Maple Ginger Cakes with Brown Butter Caramel – A Vintage Recipe Swap! 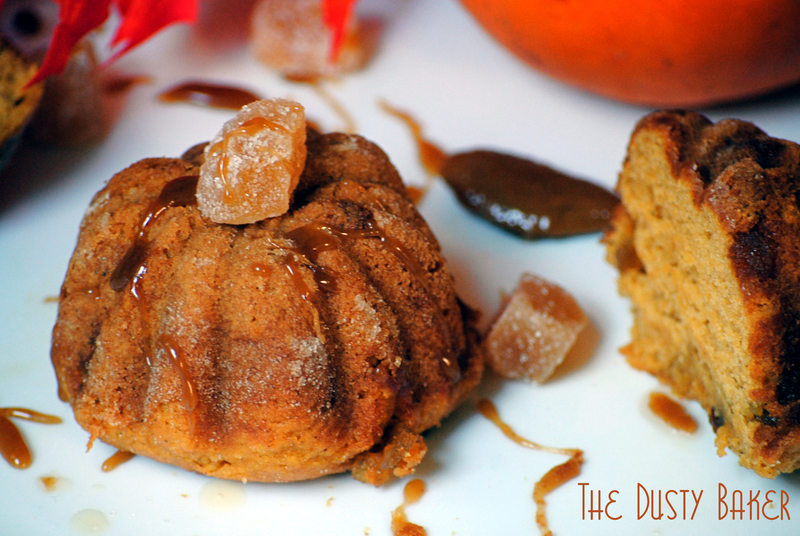 Maple Ginger Cakes - a Burwell General Store Recipe Swap! This is a very special post for this little Dusty Baker. One year ago, I started this blog. I had been blogging on another site, which housed a wider range of aspects of the holistic health industry as I pulled out of another bout of Lyme Disease. I wanted to focus on recipes, and writing, and how baking could connect me to other aspects of my art and to the art itself that is baking. Also one year ago, on the other side of the country, Christianna of Burwell General Store and Lindsay of Rosemarried started a recipe swap, comparing their takes on vintage recipes. That group grew into an incredible community of food bloggers who monthly change at least 3 aspects of a recipe that Christianna sends to us, and then we all post at the same time and exchange blogging love. I don’t quite remember if I found out about the swap from Lindsay or Toni over at Boulder Locavore – I found and fell in love with their blogs around the same time, in April of last year. All I know is that I feel very fortunate to be a part of this little group. These bloggers have become teachers, inspiring me by their personal focus in the food world, their varying levels of culinary expertise and their love for what they do, both in and out of the kitchen. Through them I get to feel the seasons change all over the world (we have several overseas swappers! ), and how that effects what we’re all making and how we’re nourishing our bodies. I get little glimpses into the lives of passionate, creative and sometimes exhausted people. All because of our shared love for food. Burwell Swappers, you rock my world. 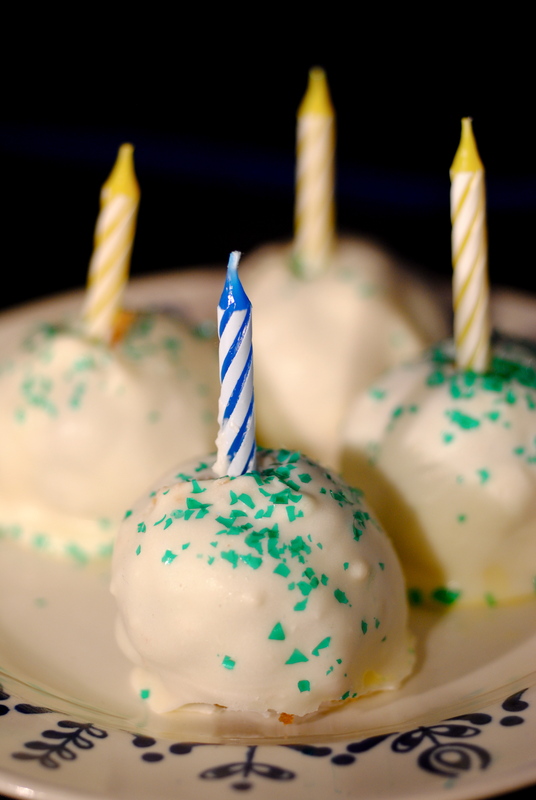 Happy Birthday to Christianna, Lindsay, Toni, Chef Dennis, Sabrina, Lora, Mari, Shari, Monique, Pola, Linda, Alli, Barb, Priya, Lana, Shumalia, Claire, Jamie, Jaclyn and Alex (did I miss anyone?!!?). And welcome to the new swappers Eda, Julia and JoAnn who are contributing this month! Please click on the link at the bottom of this post to check out their contributions, read more about their blogs at the Burwell General Store and, if you’re the tweeting sort, follow our Burwell Swappers list on Twitter. When sending us the recipe for this month, Christianna asked us to ponder where our lives have traveled this past year, what we’re thankful for and what we want to celebrate with this post. It’s been an interesting year: at points I’ve had less money than I’ve had in my entire life and questioned my decision to not have a “boss” and to work only freelance. I took on the responsibility of managing my family business, and continue to learn just what it means to be a boss. Through this blog I’ve met some incredible people, been asked to participate in live food events, and developed the voice that brought me to writing for the NYC food blog Bromography and now doing research and writing for Easy Eats, an incredible gluten-free digital magazine that as an eater I am very excited about and am particularly thrilled to be contributing to. I did a few shows, meeting insanely talented, big-hearted people. I fell in love, then had my heart broken for the first time. I got a dog! Projects that I’ve dreamed of creating have come into reality. I’ve met teachers who are so far above me in the food world, and seem to see some glimmer of potential in what I have to contribute. I am still relatively healthy after my third bout of Lyme, and my family are all close by and well. It’s been a weird, hard year, but I have so much to be thankful for. So in celebrating the anniversary of my blog and the birthday of the Burwell General Store swap, I’m doing a Thanks-GiveAway! For the month of November, I’ll be hosting discussions, comments, sharing the recipes of others and asking readers to follow the lovely bloggers who are the filling to my macarons. 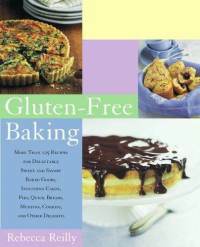 And in thanks I’ll send a few readers each two copies of some of my favorite gluten-free cookbooks, one to keep for themselves and one to give as a holiday gift to a baker they love. Along with a few of my favorite things. For information on the giveaway, CLICK HERE. Now, this month we were given a Maple Syrup Cake to swap, which overjoyed me as I love baking with maple syrup and go through jugs of the stuff far too often. After last month’s Millet Coconut Breakfast Pudding I decided I didn’t want to change too much of this recipe, I just wanted to make a really delicious gluten-free take on these cakes. My first go-around I adapted the recipe by cutting the white sugar completely, substituting with my gluten-free flour blend and adding some chopped ginger. I used 3 teaspoons of soda as gluten-free flour sometimes need the extra lift. And I added some chopped candied ginger along with increased the amount of spices in the cake. The cakes were so-so. A bit to baking soda-y and not sweet enough, even for me. And a little dry. So the second go around I added back in a bit of the sugar (palm), even more ginger, and some pumpkin, to give a little extra moisture. I also made a quick caramel sauce to serve on top. The result? Um, yum!! These are incredibly moist little cakes. 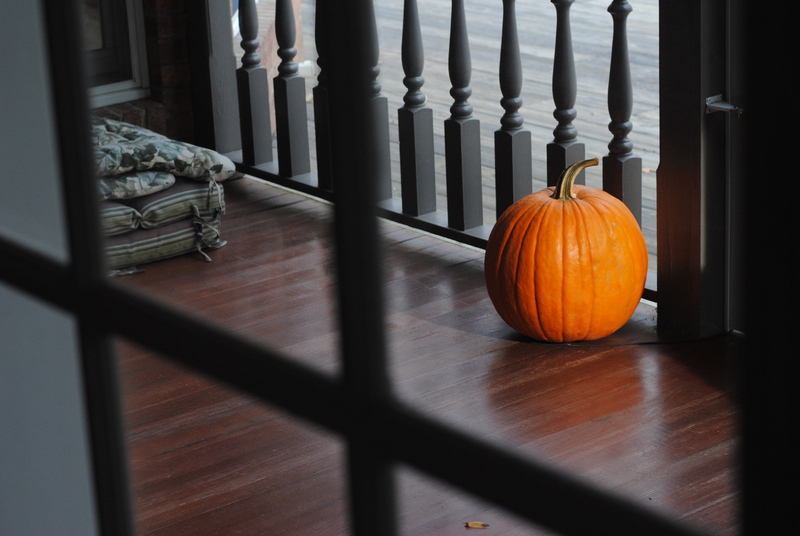 The pumpkin isn’t a feature as much as the ginger and spice, but it provides great body. The texture of the candied ginger suits the soft cake perfectly. 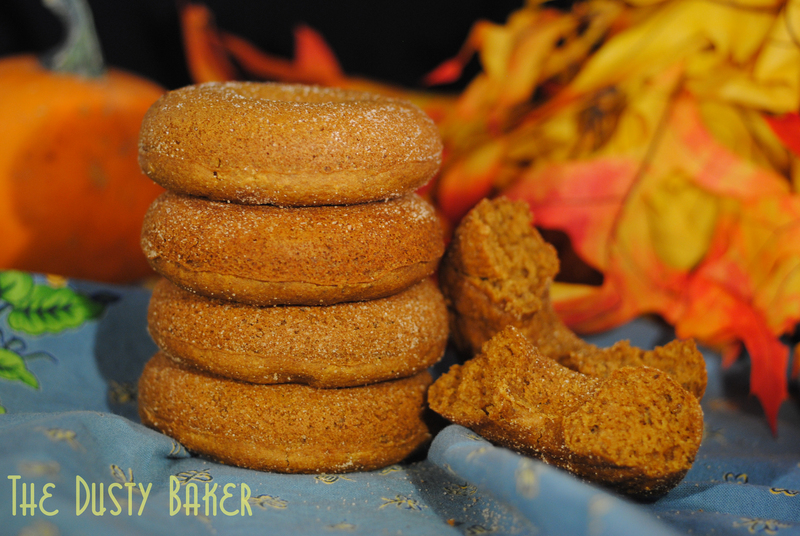 These would be divine as a special breakfast treat, or made in regular cupcake tins and topped with pumpkin or cream cheese frosting. Going on my list as one of my favorite cakes. Thanks, again, Burwell Swappers. Preheat oven to 350°. Grease and flour cake pan of choice. In a small bowl, combine all dry ingredients up to ginger. In the bowl of a standing mixer with whisk atatchment (or in bowl with hand mixer), beat butter and sugar until smooth. Add pumpkin and continue to beat until combined. Add maple syrup, and beat until smooth. Alternate the flour and hot water, starting and ending with the dry ingredients, mixing on low, until all are incorporated, occassionally wiping down the sides of bowl. Stir in the candied ginger. Pour equally into prepared pans. My cakes took 24 minutes to bake, a larger cake will take about 35. Brown 2 Tbsp unsalted butter on medium heat until golden. Whisk in 2 Tbsp maple syrup and 1 Tbsp light brown sugar, and whisk until smooth. Immediately pour over cakes and serve. A Thanks-GiveAway! Keep One and Gift One On! I have much to be thankful for this November. Fittingly enough, this is the month and the start of the season for giving thanks. Sweet. A year ago, I started this little blog. And because of it, I started baking a sh*tload! I’ve spent so much time, barefoot and with my favorite red apron strapped on, with my fingers in gluten-free flours, typing away at my dusty keyboard while tweaking recipes, and tweeting and blogging and commenting away. Through this blog I have “met” some incredibly talented, intelligent, passionate people on the web, and through them seen the seasons change all over the world. Reading their recipes and stories, I’ve seen how their environments affect how they eat, how they nourish themselves and their loved ones, how they cherish food. 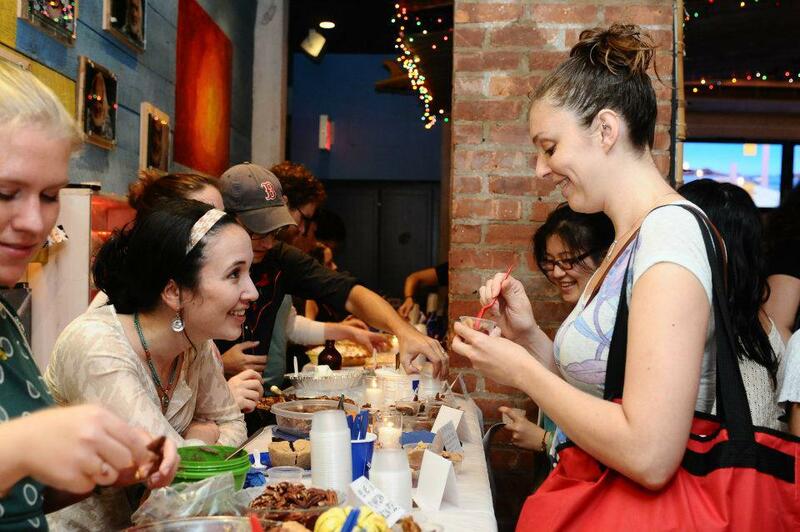 I’ve also attended so many food events in NYC, for my own interest or while reporting for NYC’s food blog Bromography. At these events I’ve met some insanely delicious chefs and entrepreneurs. If you’re reading, you all know who you are, and that I think you’re rock-star. Recently I became an intern at Easy Eats Magazine. It’s a gorgeous digital magazine devoted to the gluten-free world. I am completely in love with this magazine – the layout, the content, the ease of use and the variety of information. I’m psyched to be contributing. A year ago as well, Christianna at the blog the Burwell General Store began a recipe swap, and last April I joined it. Every month the 25 or-so bloggers have taken one recipe and thrown our individual spins on it. We’ve supported each other in failed recipes, changing relationships, lost jobs and cranky moods. And some have even met in person. I have a feeling more will do so with time. 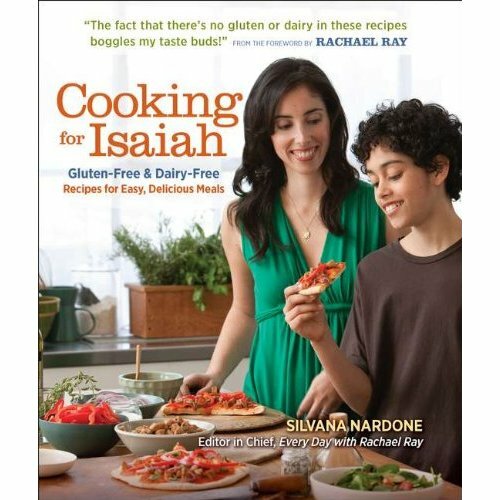 Enter my Thanks-Giveaway to win TWO copies of one of my favorite gluten-free cookbooks: One to keep and one to give away for the holidays! 1. Leave a comment on this page with someone or something you’re thankful for, in relation to food and/or gluten-free cooking. Who would you give the book to? Who do you want to cook gluten-free for? Subscribe to this blog with the little “Lead On Dusty” button to the top right of this page. Follow me on Twitter at DustyBakerGal and tweet this giveaway to your followers (@dustybakergal me too so I can see!). Follow the Burwell General Store Twitter List on my Twitter Page, so that you can keep up with all the crazy food news from those incredible people. Sign up for your initial free digital Easy Eats Gluten-Free Digital Magazine issue. I know once you see one, you’ll be so psyched you’ll want to subscribe!! Comment on any recipe coming up in the month of November on my page with a link to something you’re bananas about on yours, so that I can check it out and comment back! Do these things, and win TWO of one of these cookbooks, one for you to keep and one for you to pass along! Also, some fun little stuff that will be a surprise, wrapped up all special-like just for you! Oh, and note that none of these books came from the publishers – they’re all on me, just because I love them so much. Thank you for being so delicious!